I am not a big fan of spiders. 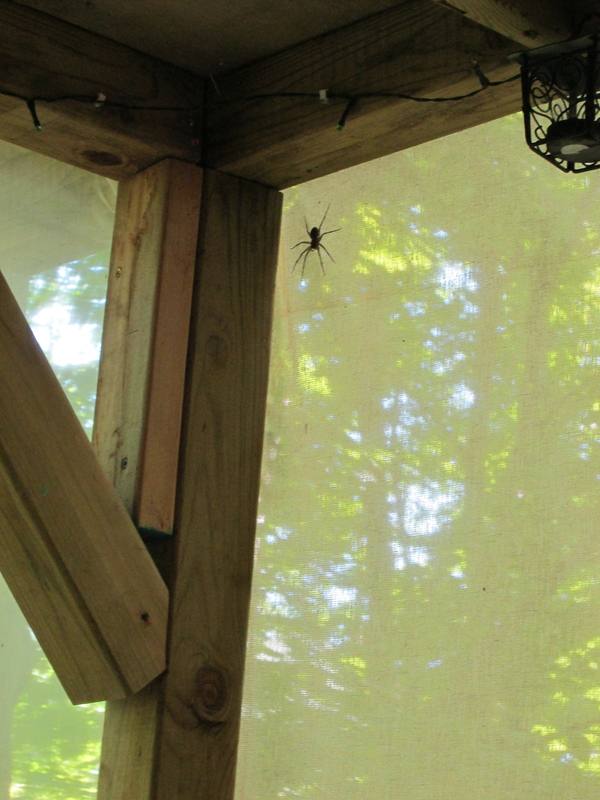 I like the work they do… catching and eating mosquitos But the simple thought of having a huge jumping one in a confined space like Tiny House Ontario (with me) is what my personal nightmares are made of. This one, is the variety I fear the most because they can jump at least 3 feet. I know this, because I witnessed last years giant do so when I accidentally brought it in to the in-house on my ladder. A few days ago I spotted this magnificent apex of vileness, on the cloth porch. I did not wish to kill it, and honestly I was too afraid of it to catch it… and now I don’t know where it is… This means, I have to keep the door closed between the two. Above all, do NOT want the creature in the house with me! Simply put, if it got in, I would have to move out until someone was able to get it out for me. Now you know…. just like Jim Stafford, I don’t like spiders and snakes. Jim Stafford reference. Nice. Signed, A Child of the 70’s. 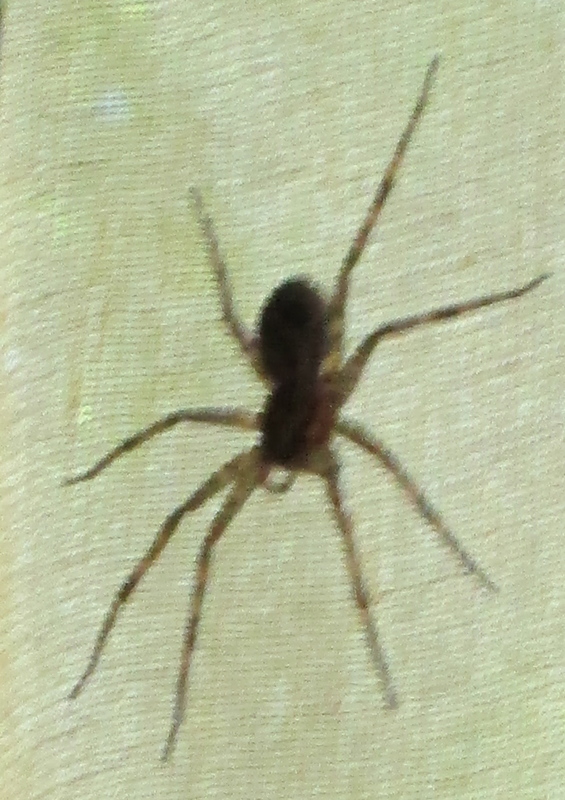 It is said that due to the ratio of spider population to people population…there is at least one spider within a six(6) foot radius of every person no matter where they are on earth (including on the water)! I am not afraid of most spiders. I am only afraid of the ones that jump. I very much enjoy watching a yellow garden spider on their doing their spider business on their web. I am live and let live with the many daddy long legs. Thankfully my irrational fear is only for things that startle me. I am pretty much consistent with the things that I fear. I don’t like anything jumping out, flying at, surprising me, be that bugs, birds, moths, spiders, snakes, people – I don’t like to have things come at me or suddenly invade my space. I would happily accept a hundred daddy long legs within inches of me, for one of these big jumping things ten feet away! Shame on you for speaking like this of this fine creature who does so much good work for you catching other bugs! Where did you get such irrational fears? We don’t even have any dangerous spiders in Canada. I dread mosquitos more – mainly because they want my blood and too often they get it! That is the thing about irrational fear… it is irrational. My sister also kills them, but I can’t bear to kill anything except a mosquito… self defence. I don’t remember these huge jumping spiders from when I was a child. I don’t mind the regular run of the mill web builders though… they just sit so quietly and I don’t fear them jumping on me, which I guess is the problem that I have. I don’t want to be touched at all. Oh I hear you! We need to find a resource for you with a way to catch and release those guys, or some type of bait you can lay to chase them away–that wont in exchange invite other species of bugs. How are you finding the air out there these last few days? It’s unbearable here (& I’m in no city) close to Guelph…it must be cooler up there? How’s the door closing thing working, better? HOPE YOU DIDN’T TO HAVE TO KILL IT. i HAVE PUT THEM OUT AND THEY WILL PLAY DEAD FOR SOMETIME BEFORE LEAVING. No I did not kill it. But now I can’t use the closed in porch because I am afraid of it and I can’t seem to find it anymore. Where are the white nights who can catch these for damsels in the woods? I hoped it simply moved away due to the lack of food in there, but without knowing for sure, I will be keeping the door between the porch and the house closed off until my paranoia subsides.